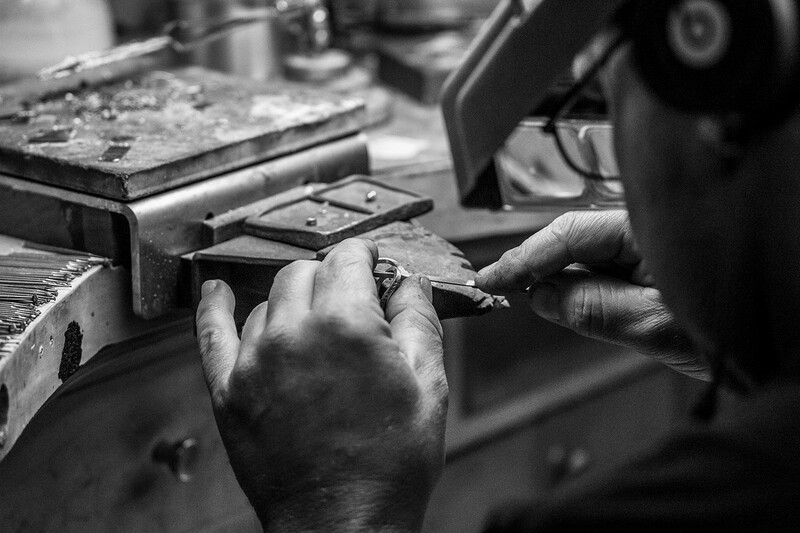 Repair and design is performed on-site by our Master Bench Jewelers. Our jewelers are always happy to help return your precious pieces to working order or transform them into new designs. They can use your original stones or metal to re-create an original heirloom. It is very important to maintain your jewelry. 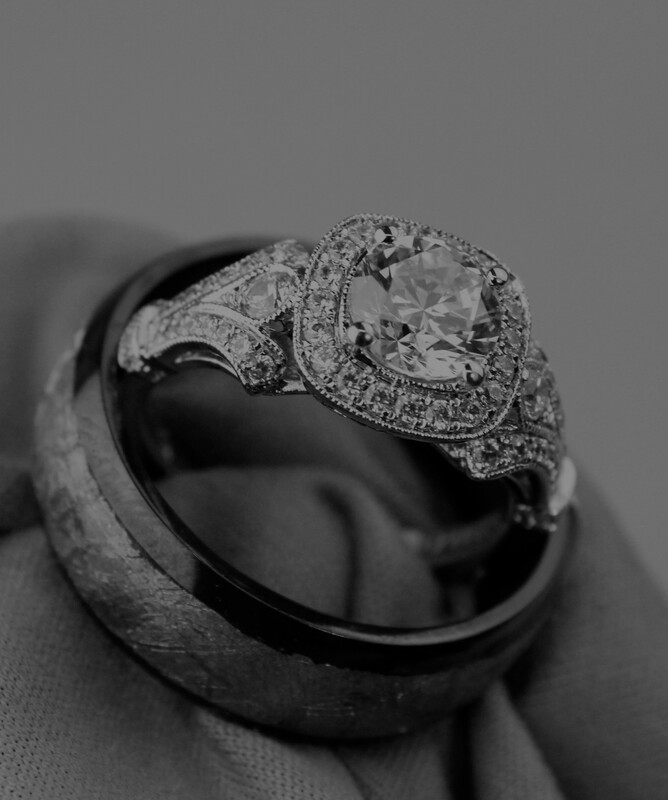 Our complimentary jewelry cleaning and inspections allow us to check to see if any stones are loose or prongs are worn out. Detecting this early might save you from replacing a lost stone later. Plus you get to enjoy having clean and sparkling jewelry! We specialize in custom design because our passion is to turn your dreams into reality. Whether you have a piece in mind or want to transform an existing piece into something new, custom design is for you. By choosing to design your jewelry you get to be involved in every step of the process. We start by listening to your desires to get a complete understanding of the piece you have in mind. Then, we begin drawing your design. Once we have settled on an appearance, we hand carve the design out of wax so it can be cast in the metal of your choice. Once we have the casting, we set your stones and polish the piece. Finally, you get to enjoy wearing a one of a kind masterpiece to represent the one of a kind you. All jewelry repair is done on-site by our Master Bench Jewelers. Our service list includes anything that needs to be done to return your precious pieces to working order or transform them into new designs. An abbreviated list of our repairs include the following: Ring Sizing, Soldering Diamond and Gemstone, Setting Metal Refinishing, Rhodium Plating, Chain and Clasp Repair, and Pearl Restringing. Appraisals are done on-site by our GIA Graduate Gemologist so you have proper and accurate insurance documentation. Your appraisal will include a detailed description, gemstone and/or diamond identification and grading, metal analysis, and retail replacement or estate value. All engraving is done on-site by our jewelers. We have a selection of block, script, and interlocking monograms available to choose from. We understand that the incline in the price of gold has you looking over your jewelry box. That’s why we buy gold, silver, platinum and diamonds and offer a check or an increased amount of in-store credit to be used. That way you can turn your unwanted jewelry into cash or something new. Champagne Jewelers offers several different financing plans. We have 6 to 18 month special financing available. Offer subject to credit approval. Some restrictions apply. Ask for details. Please stop by Champagne Jewelers anytime to fill out an application and find the jewelry you have been looking for. With Champagne Jeweler’s Reserve Program, you can get a head start on holidays and special occasions by shopping early. With a deposit, we will reserve your merchandise up to 3 months and you can make monthly or bi-weekly payments of your choice.